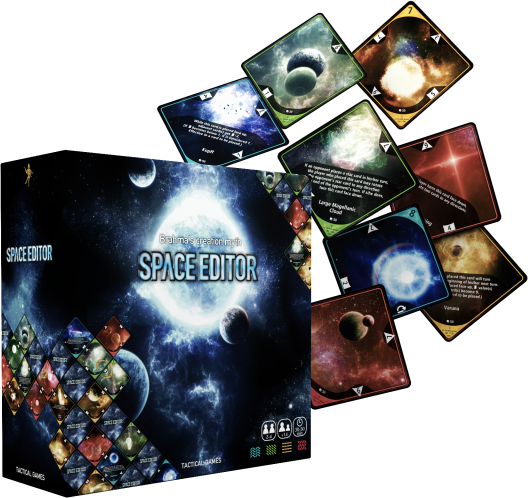 Space Editor is a battle card game whose theme is the creation of the universe. 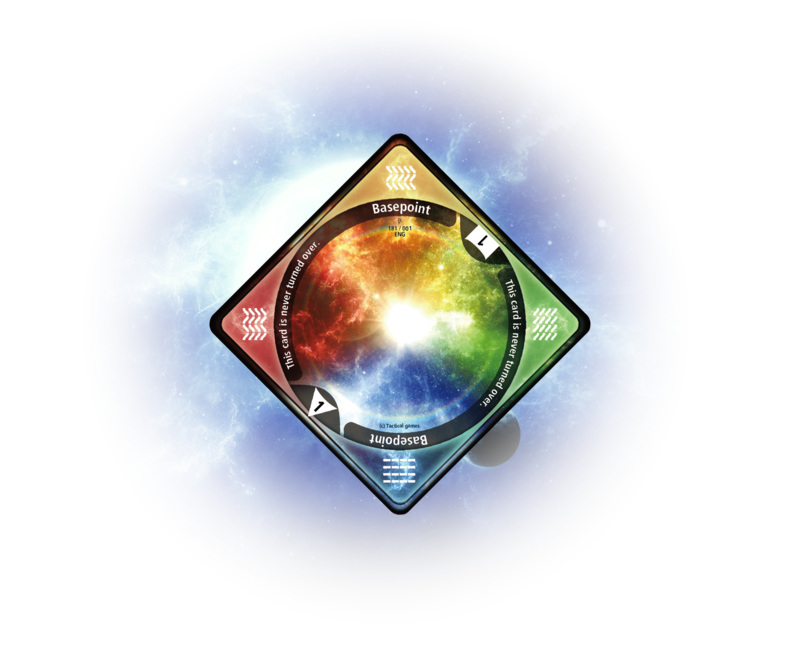 As a player, you will become an incarnation of a god that governs an element constituting the universe. Create the universe and own it with strong control! 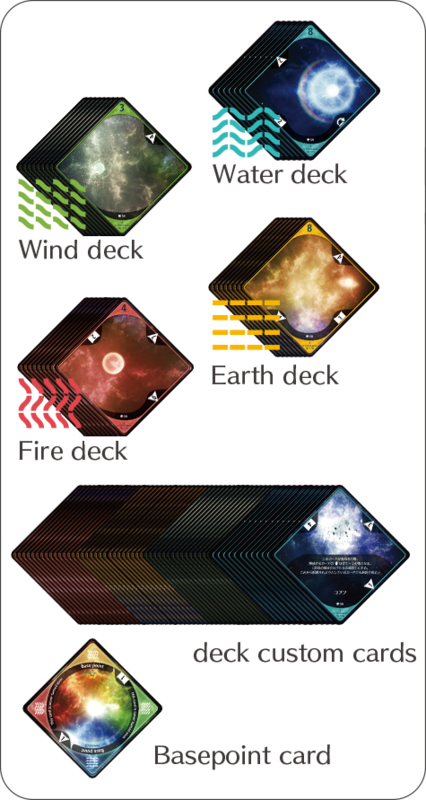 63.5mm x 63.5mm, 2.5" x 2.5"
There are four types of cards in Space Editor: star cards, planet cards, ability cards, and a basepoint card. 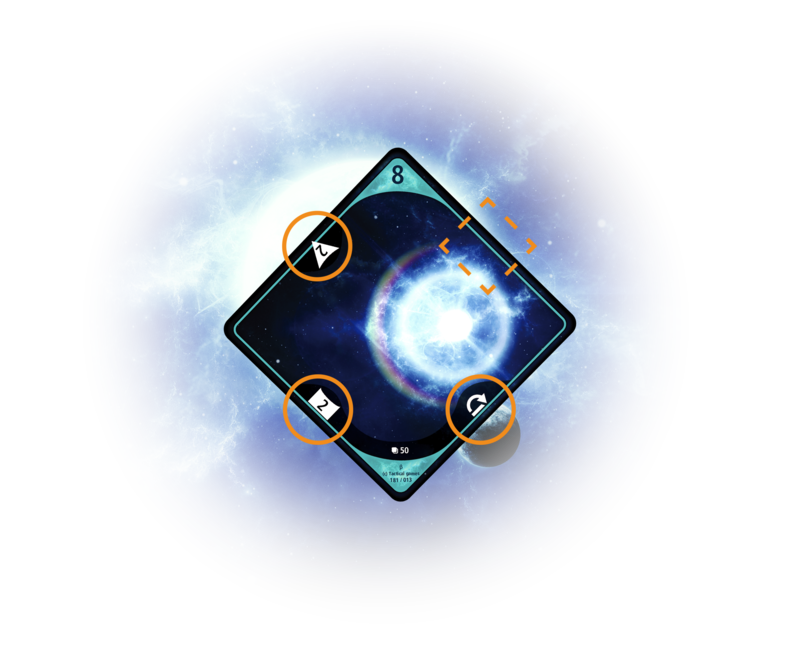 Star cards have victory points and will lead you to victory. 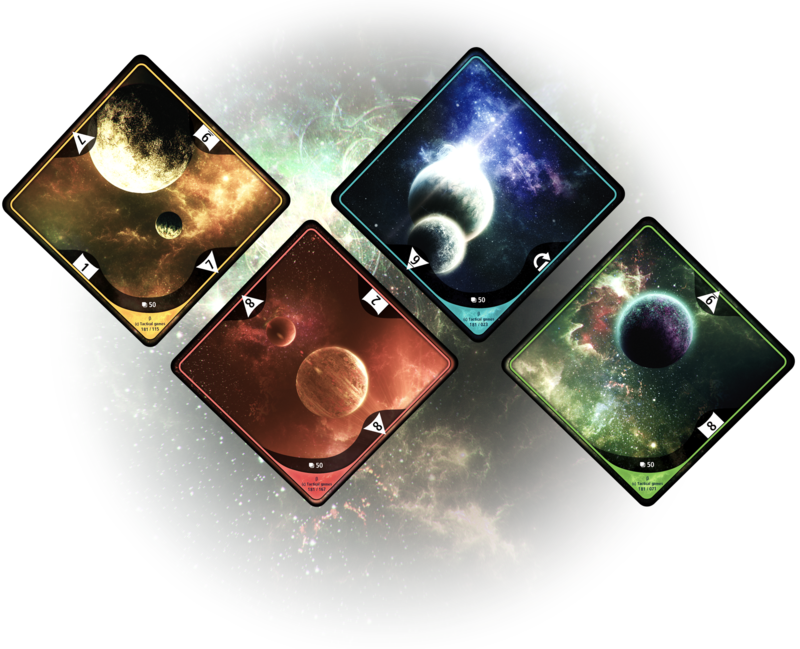 Planet cards are powerful weapons; they can attack opponents' star cards or protect yours. Ability cards are the key to your strategy. Players take turns placing those cards. The player with the highest score (the sum of the victory points of face-up star cards when the game ends) is a winner. The basepoint card is the center of the universe. It should be first placed and the game will start by connecting other cards to the basepoint card. 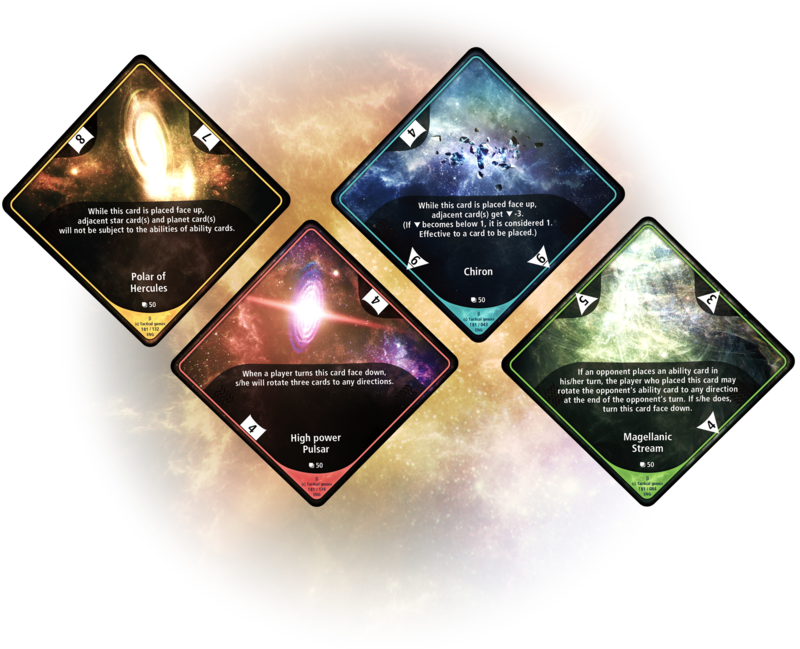 Each ability card has its own unique ability, which will take effect when the described conditions are satisfied. You can advance the game more tactically by keeping them on your side. 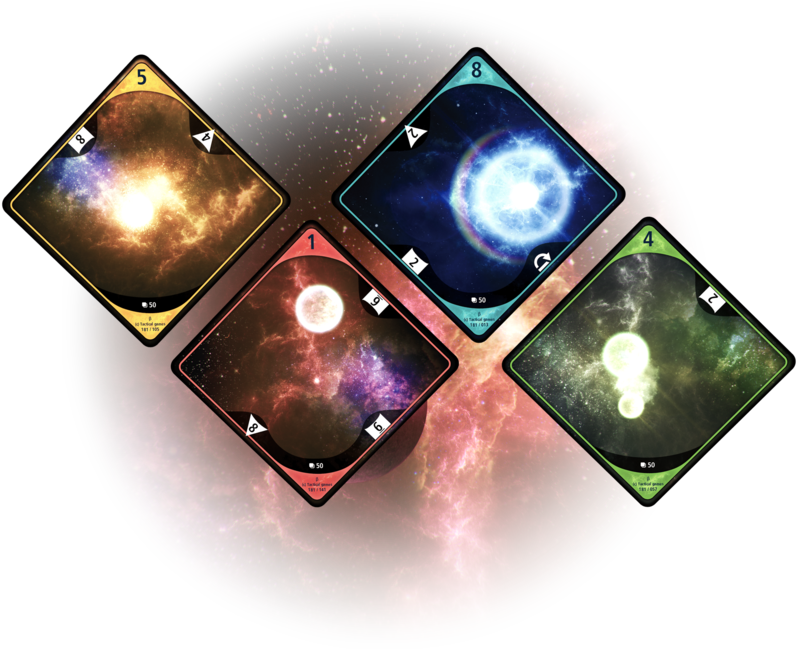 Each element has its unique ability cards with element-specific abilities. A side of a card has an impact value, which indicates its power against an adjacent card. A symbol, either alone or in combination with a number, produces effects such as turning over an adjacent card. With this mechanism, you can turn over your opponents' cards and protect your cards so as not to be turned over. There are combinations of symbols which can be or cannot be connected. The effects of the symbols and the connectable combinations are also applicable to a side with no symbol and sides of a face-down card. *Adjacent refers to a state in which two cards are placed so that a side of one card is in contact with that of the other card. Suitable for a casual gameplay among a group of people. Compared to full game mode, luck in card drawing has a significant effect in half game mode, thus you can enjoy a casual gameplay even when there are only two payers. For 2-4 players. 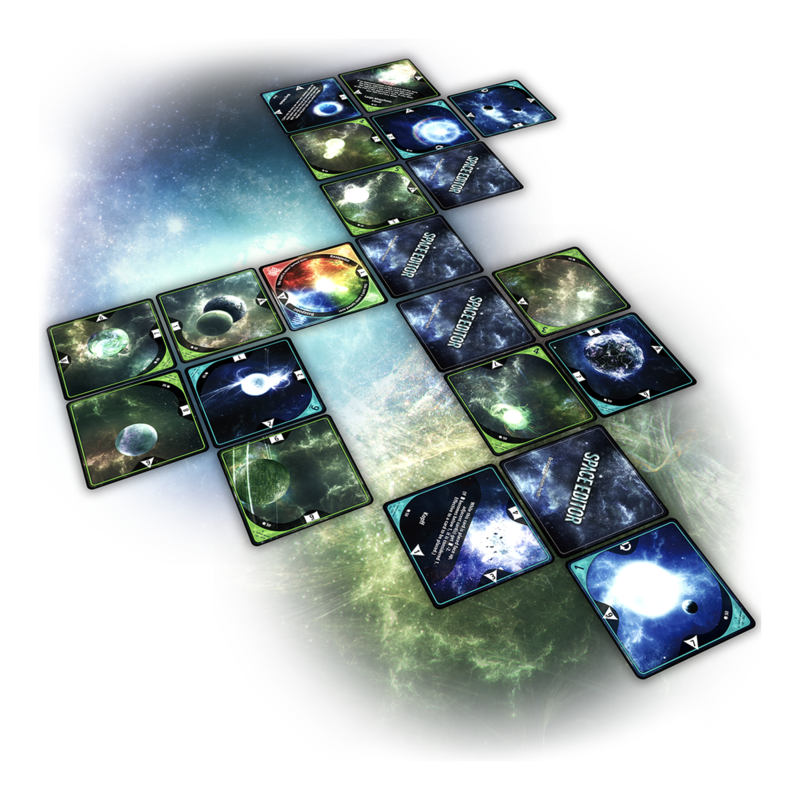 Each player chooses an element and picks a deck of cards of the element, which is used as a draw deck. Draw two cards from the deck, which become a hand. Then, decide turn order and the last player in turn order places a basepoint card on the table. Players take turns until the game ends, which is when no player can draw a card from the draw deck (no card is left in the draw deck). The player with the highest score (the sum of the victory points of face-up star cards when the game ends) is a winner. Place step: Pick a card from the hand and place it to be adjacent to any already placed card(s). Discard Step: Discard the remaining card in the hand, which is not to be used in the game. Draw step: Draw two cards from the draw deck and add them to the hand. The player's turn ends. In full game mode, you can enjoy a strategic gameplay. You can unleash your deck’s potential to its fullest, while various developments can occur. Suitable for a serious gameplay between two players after getting used to the rules. For 2 players. Each player chooses an element and picks a deck of cards of the element, which is used as a draw deck. Draw four cards from the deck, which become a hand. Then, decide who goes first and the second player placed a basepoint card on the table. Players take turns until the game ends, which is when both players empty the draw deck and place the last card in the hand. 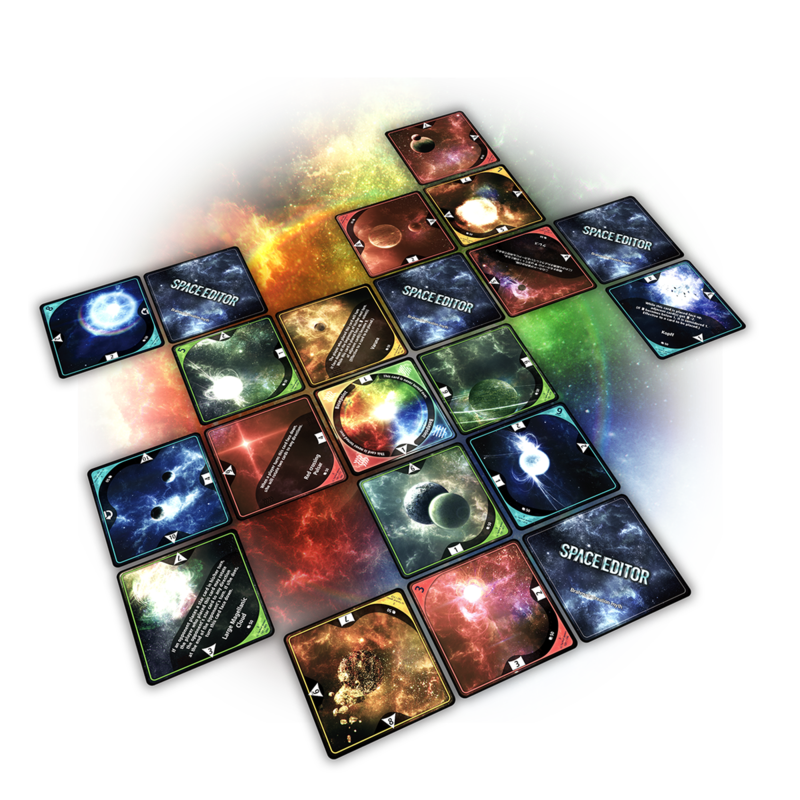 The player with the higher score (the sum of the victory points of face-up star cards when the game ends) is a winner. Draw step: Draw a card from the draw deck and add it to the hand. Ability resolve step:Resolve any abilities of ability cards which come into effect in place step. The player's turn ends.